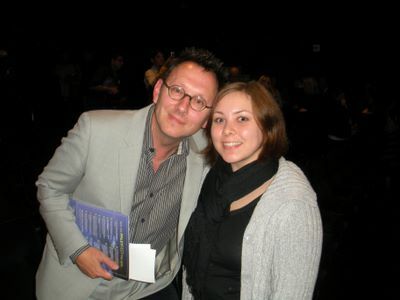 A photo of his girlfriend Britt with Lost's Michael Emerson. 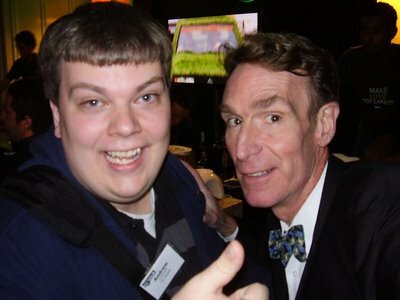 A photo of Andrew with Bill Nye, "The Science Guy". Thank you for tackling this topic on your show. Several years ago you were in Seattle, and my wife saw you at Pike Place Market. She preemptively did not point you out until you were gone because she knew I would want to "geek out" and tell you I really enjoy your writing and appearances on The Daily Show. After listening to this podcast, I politely let her know that she was wrong (I believe my exact words were "In Your Face! ")and that next time we see you in public, it would be o.k. for me to release my inner fanboy. for taking this case and covering this topic, because it's something I've been worried about since approximately two years ago when I started getting opportunities to meet some of my heroes. I wanted to ask the comedians I've met what sort of behavior they prefer from fans at events, but there's always barely enough time to say thank you plus one remark that I'll be embarrassed about later, and to get a photo or autograph. I was relieved to find that you share the same philosophy I already had on meeting people, and I was glad for the reminder that the Facebook collection gallery is not as big a deal as the moment of interaction itself. I also appreciated Hodgman's aside that he got into freelance journalism partially to have reason to meet people he admired. I always want a photo when I meet my heroes, not to remember the meeting or ogle the pretty faces [too much], but to motivate myself in my own creative endeavors. I have one in particular of Joel Hodgson and me that I use as a wallpaper on my cellphone. The photo reminds me of what we talked about, and the advice I've read in his magazine and internet interviews, and it reminds me to stay focused. To me it says, "We are both nice people and I had a nice human moment with this person. They are famous and I am not, but there's no reason I can't put in the amount of work that they have done to be successful. Under different circumstances we might be friends. I am not an inferior person for not being famous too." I worry that I may be looking for validation and self confidence boosts from the kind people I've met, but I think I keep a rational perspective about it and try to focus the positive meetings into memories that motivate me to keep at my own writing and art projects. I'm left still wondering how much conversation it's ok to make in a signing line, like random stuff beyond thank you and direct questions. To get over my shyness I often turn my brain toward the stream of consciousness to stay in the moment when I meet famous people, and I share any odd random thoughts about something I heard or read recently. Sometimes I babble. It's probably because I want to give back a little something and a bit of entertainment in return for all the joy they've given me over the years. I wish I knew whether this behavior of mine is pleasant, OK, or annoying. But I assume it all depends on who I meet and what sort of personality type they are. Joe Jackson wouldn't have cared if you were a good looking woman, John. I listened to your recent ruling regarding the social mores of approaching celebrities with eager anticipation, hoping you would address the broader question: when is it acceptable to approach celebrities, and when is it not? For example, in the middle of dinners at a fine dining establishment? While Your Honor is touring Storm King with his wife and children? My husband and I have been debating this point for several years since that day. Discretion won, so Your Honor lost some praise in exchange for privacy, however faint. We also left Matt Damon alone during dinner in Santa Fe at the start of the filming of True Grit, although if The Dude had been in attendance I doubt my husband would have been so bashful. In other matters, Your Honor may have an opportunity to take a former employer to task. "Hodgman" is not in my iPad's spellchecker, what's up with that?